The first word that comes to mind when you think of Otis Clay is "passion." Clay personifies that word, whether he's singing his soul/blues at a outdoor festival down South, at a concert in Japan (where he's achieved superstar status), or praising the Savior in a gospel setting. No one mixes gospel, soul, and the blues as well as Clay, and it is his intense, heartfelt vocals that enable him to pull it off successfully. Probably best known for his tenure with Hi Records and producer Willie Mitchell, which produced his best known hit, "Trying To Live My Life Without You" (covered by rocker Bob Seger in the '80s), Clay has been absent from the studio since 1998. To remedy the situation for fans in dire need of a fix, Fuel 2000 Records has released Testify!, a collection of Clay's sides cut for One-derful! Records in Chicago from 1965 to 1968. Having previously recorded with the Gospel Songbirds, Clay was singing with the Sensational Nightingales when he was brought to One-derful! by Chicago vocalist Harold Burrage and fellow Gospel Songbird Maurice Dollison (who later became better known as Cash McCall). One-derful! featured some of the grittiest soul being recorded at the time and Clay's fiery delivery fit right in with the style. He recorded some incredible sides for One-derful!, ranging from the raveups ("I Testify," "Got To Find A Way" and "It's Easier Said Than Done") to more urban fare ("Tired of Falling" and "I Paid The Price") to deep Southern Gospel-influenced Soul ("A Flame In Your Heart," Clay's first release, and "Don't Pass Me By"). Also, the Cash McCall/Milton Bland composition, "That's How It Is," which was Clay's first visit to the Billboard R&B charts in 1967 and has been one of his most-requested songs (and one that he has subsequently re-recorded for Hi and Bullseye Blues) over the years is featured here in what is probably the definitive version. To complement these wonderful sides, there are nine sides that were unreleased at the time that are being heard for the first time on a domestic release. They stand up well compared to the other tracks, with the most prominent of these unreleased gems are "I Don't Know What I'd Do," featuring a blistering vocal by Clay. In addition, there are informative liner notes from blues/soul scholar Bill Dahl. This is a set that's long overdue. 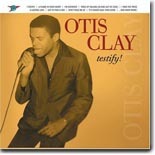 If you're a fan of Otis Clay, or of raw, gospel-based soul, these recordings are absolutely indispensable.